Photograph by R. H. Hensleigh. May Morris learned textile design from her father, William Morris (1834-1896), and embroidery from her mother, Jane Burden Morris (1839-1914). An astute businesswoman, author and lecturer, May was so accomplished as a designer and embroiderer that she became Morris & Co.’s director of textile production at age twenty-three. These panels were exhibited at the 1916 “Arts & Crafts Exhibition” in London and were reproduced in The Studio: Year-Book of Decorative Art in 1917. In November and December of 1920, the panels were shown in the “Exhibition of British Arts & Crafts” held at the Detroit Society of Arts & Crafts. 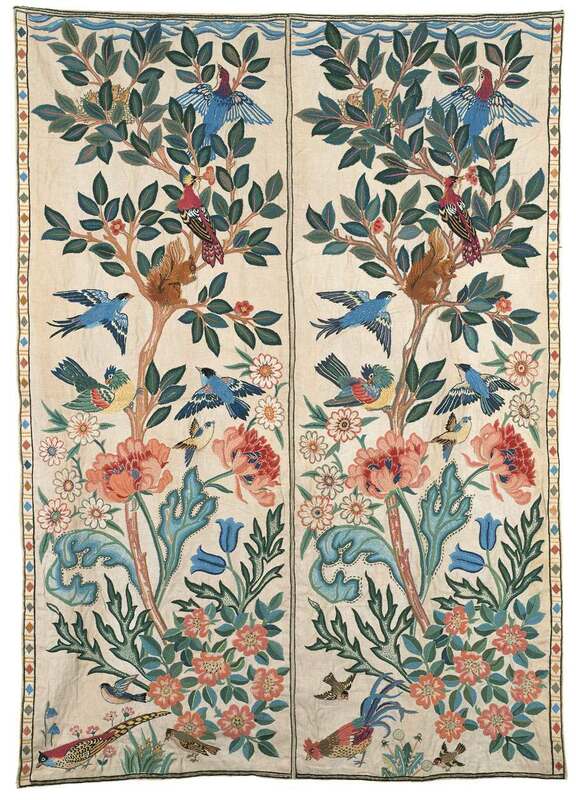 George Booth, who met Morris during her lecture tour in the United States in 1911, purchased the panels out of this exhibition along with the matching valance and embroidered headboard panel. Booth hung these on his own bed in Cranbrook House where they remained until they were donated to Cranbrook Art Museum in 1955.